Center stage was the big top complete with high were cyclist. 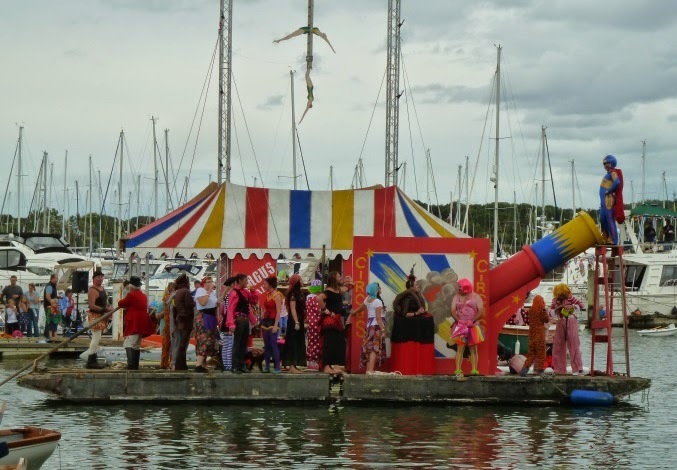 And away from the main event plenty of dinghy sideshows. During the afternoon there was even some competitive racing at times. 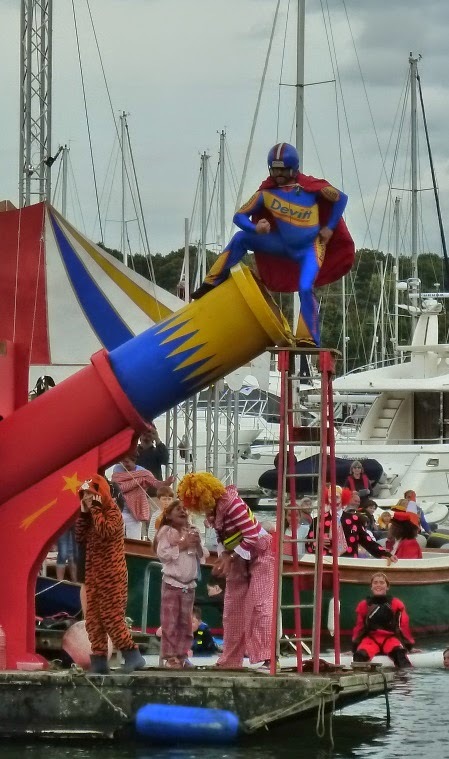 Until the grand finale which featured the human cannonball ably assisted by the troop of Cirque de Bursledon, interesting that the strongman is standing by while the ringmaster took charge of sculling. 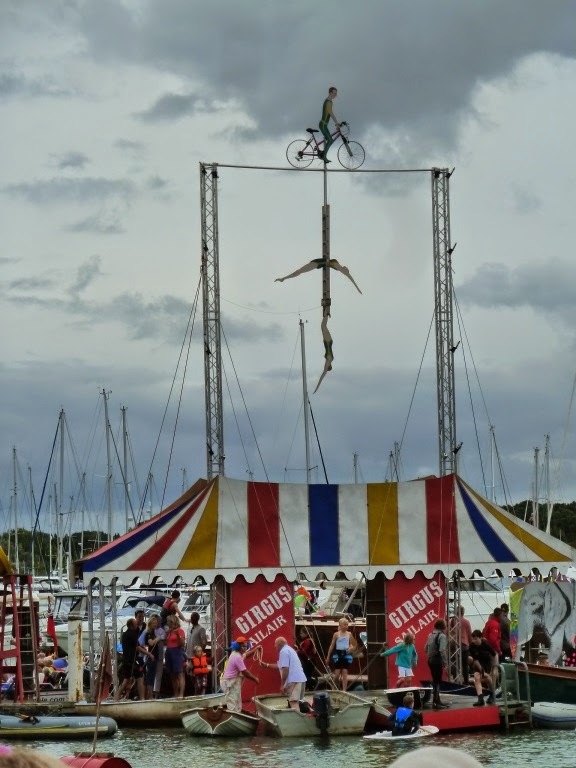 Local Bursledon daredevil, did actually get fired from the cannon, sadly the photographer was drinking his beer and missed the shot. 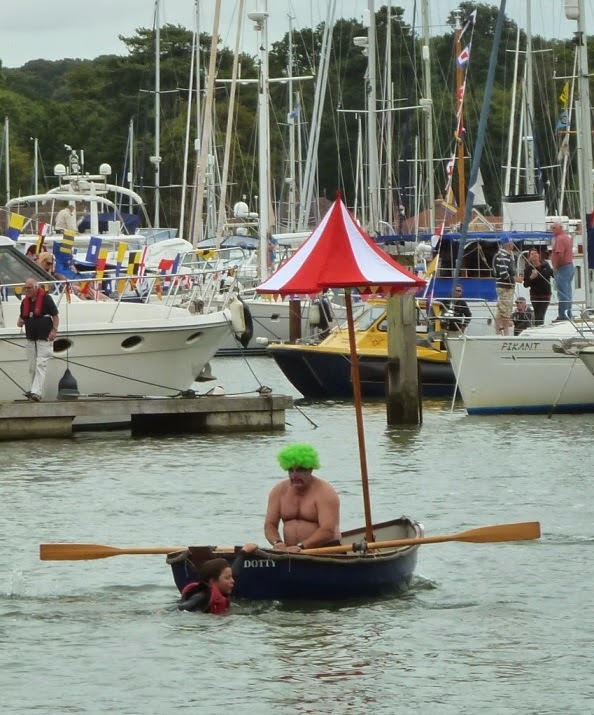 The bursledonblog nomination for the best dinghy which just goes to demonstrate the capability of the famous Tinker Tramp dinghy. 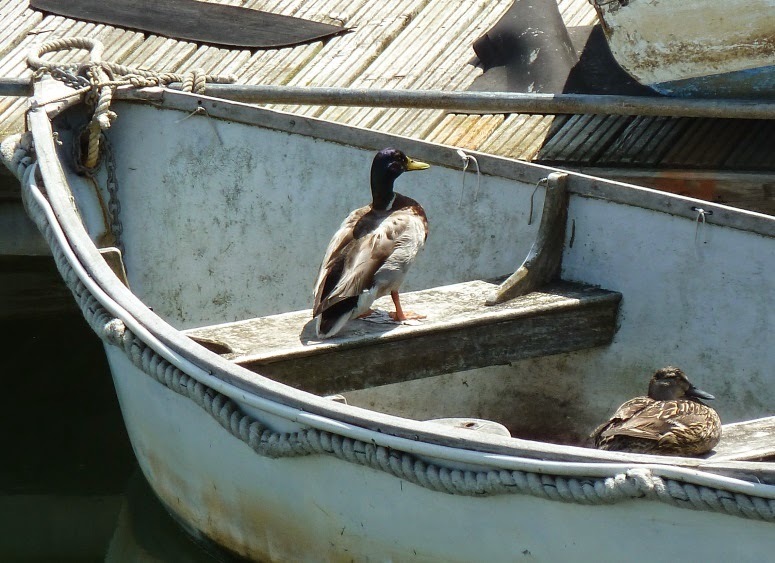 I've written before about dinghy neglect, beware the squatters might move in. 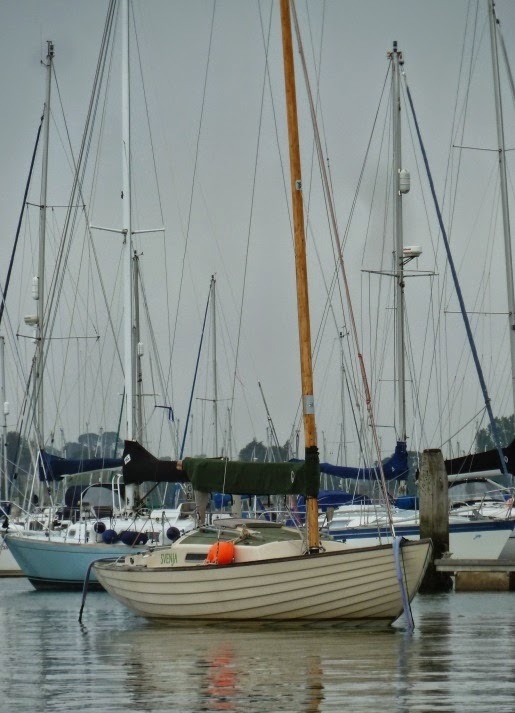 This week's Folk Boat comes from the Pacific North West courtesy of fellow blogger Doryman. Lorraine sails out of Port Townsend and is cared for by renowned sail maker and voyager Carol Hasse. 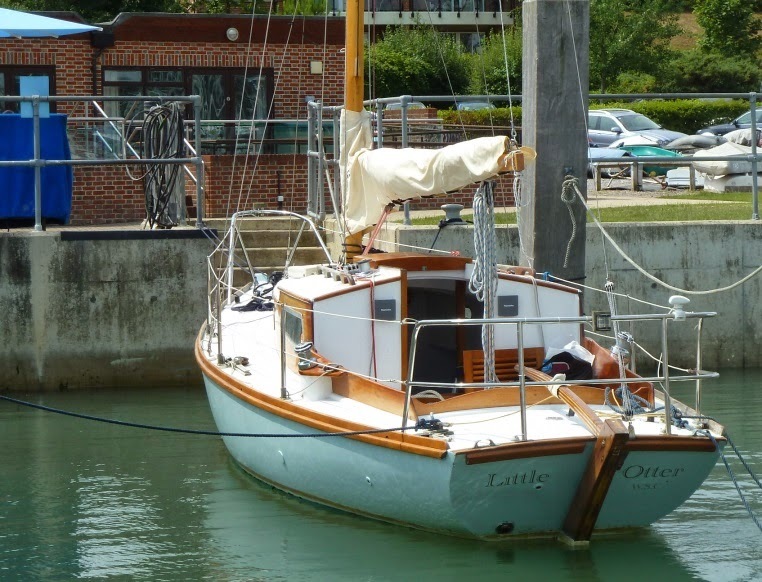 Despite having sailed some 45,000 miles in just about every type of boat Carol has owned Lorraine since 1979 which speaks volumes for a boat designed over 70 years ago. Volumes is not a word one would normally associate in the context of Folk Boats perhaps, but the interior of Lorraine looks homely, safe and very practical. 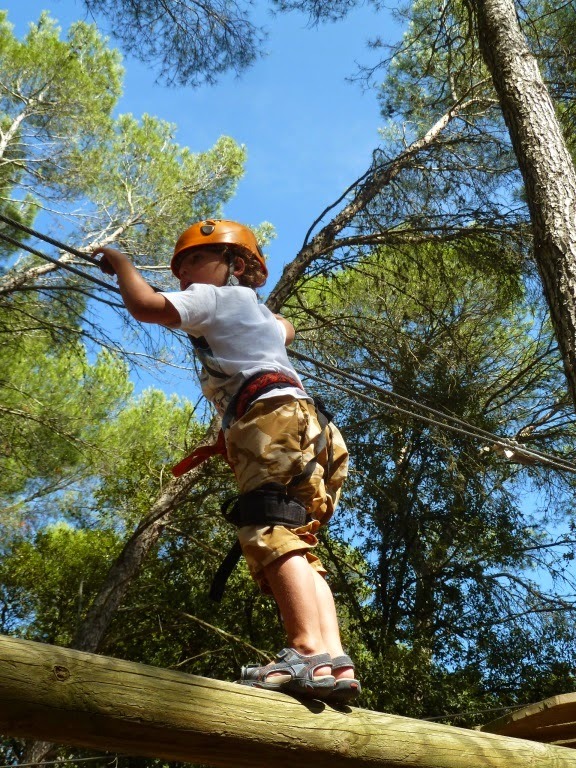 We had stopped off in a Luberon wood as Joseph had convinced us that he was up for doing the French equivalent of "Go Ape" which is a sort of high wire adventure playground on a course strung around the tall pines. 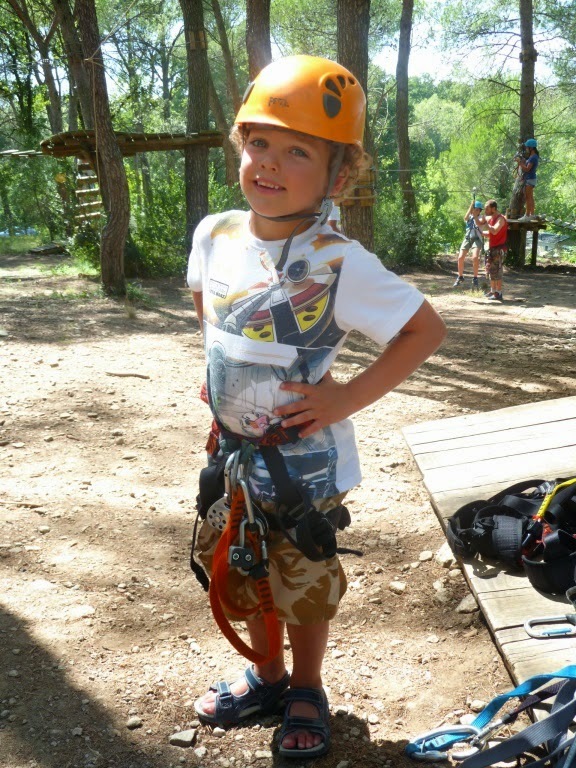 Despite his confident pose we parents were mightily relieved by the safety harness and the training briefing. 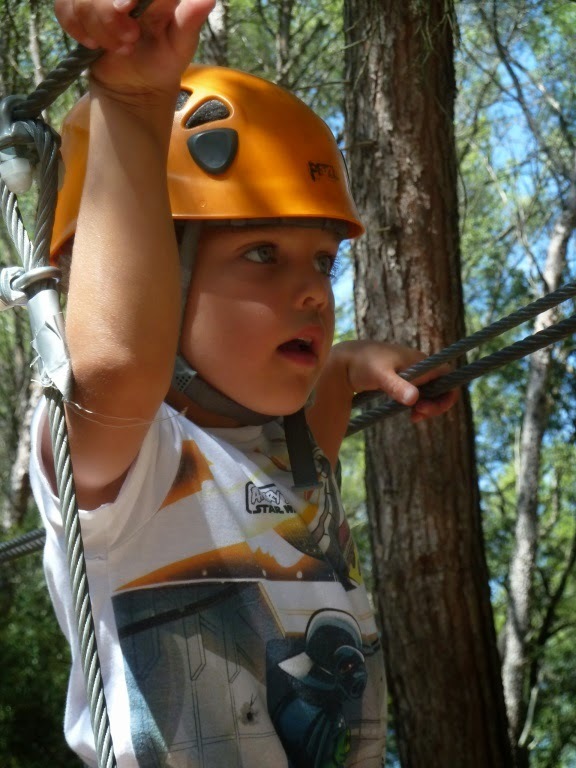 Getting to grips with the clip on, clip off routine on the lower levels took come concentration at first. 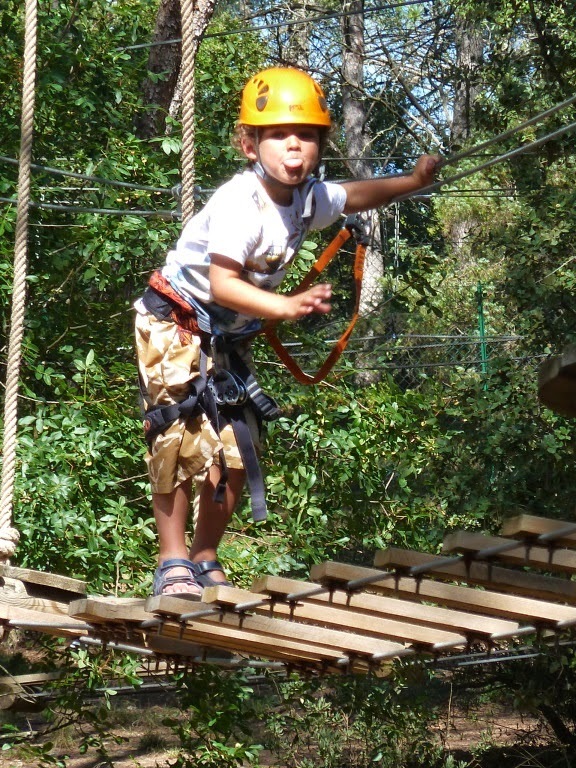 But pretty soon he was up onto the high levels with barely a thought about anxious parents down below. And finally maybe just a little too confident. 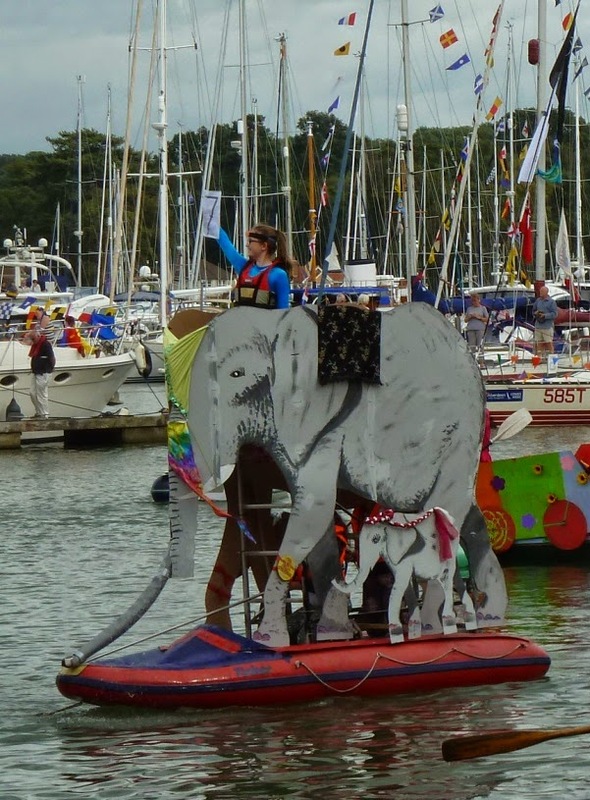 We were away on holiday for Cowes week, but there are still a few interesting boats around. 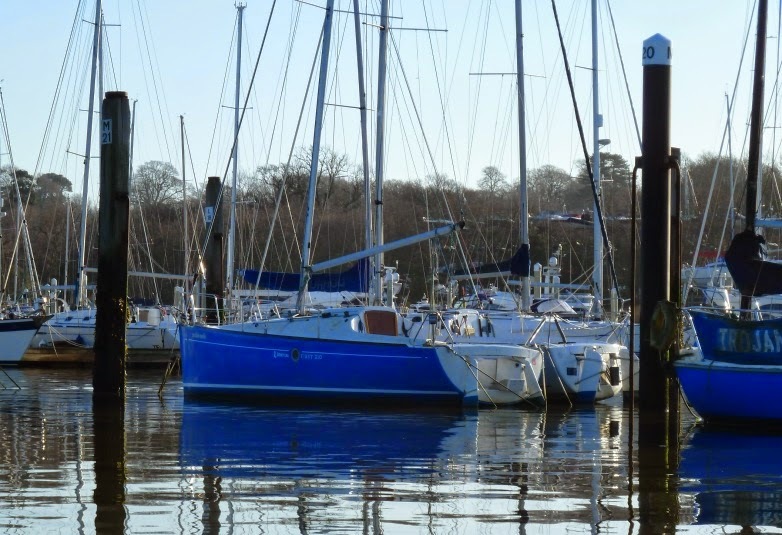 Fellow blogger and co author of 1001 Boats, Patrick sent me details of an intriguing painting by Keith Trask, a well known local marine artist and yacht portrait specialist. "I have sat and looked at this painting hundreds of times, trying to figure out exactly what is going on in it. Is it evening or morning? Is that the Queen Mary approaching Calshot and about to turn into Southampton Water? What are the crew of the yacht doing? Are they stowing the main or getting ready to hoist it? Why are they under spinnaker alone. Is that a Commadore’s burgee at the masthead or a racing flag? 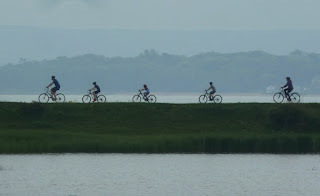 If they were racing but have now stopped, where was the finish line? Why didn’t they drop the spinnaker there? 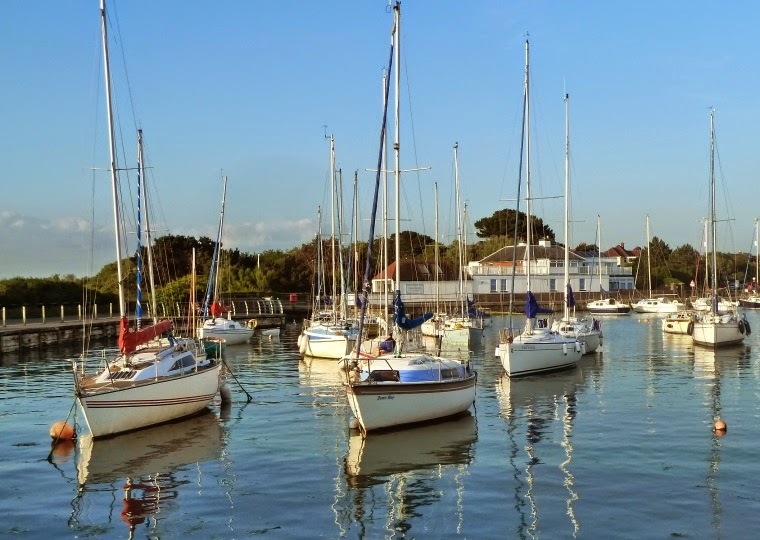 Have they just come out of the Hamble or are they further up Southampton Water – perhaps off Netley? Maybe they are trying out a new spinnaker. It looks like the Herbulot pattern that was briefly popular in the late 50s or early 60s. I think this design with the holes in it was then banned by the RORC so that dates the scene, as does the absence of the Coastguard tower at Calshot." Although I haven't had the chance to sail over there recently I agree that the location appears to be Southampton water near Netley. If so the sun seems to be in the south west or west which puts the time as late afternoon or evening. As to the other questions we welcome imaginative or factual replies from BB readership. 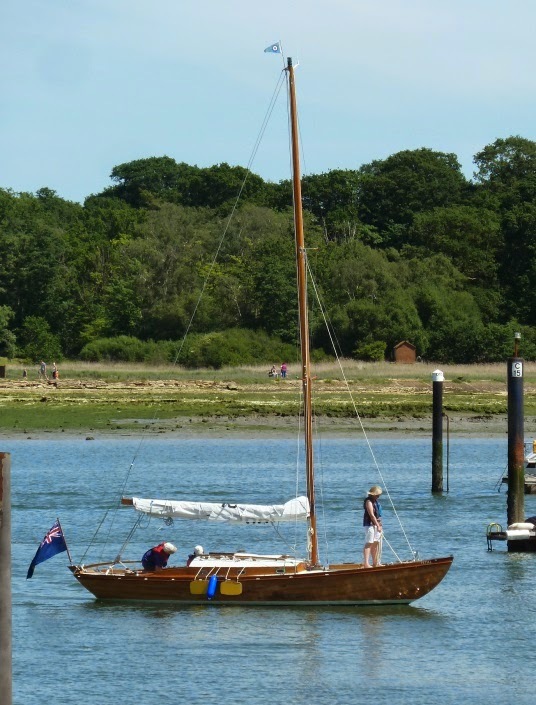 What with this being number 13 in the Folk boat Friday, the old superstition about Friday 13th and sailors having a strong superstitious tradition here's Little Otter and she might not actually a Folk Boat but has some strong parallels full keel, rudder mounted on a full transom. As all too often no one was aboard so I don't know what she is, most likely built in the early 1960's and looking good for her age. 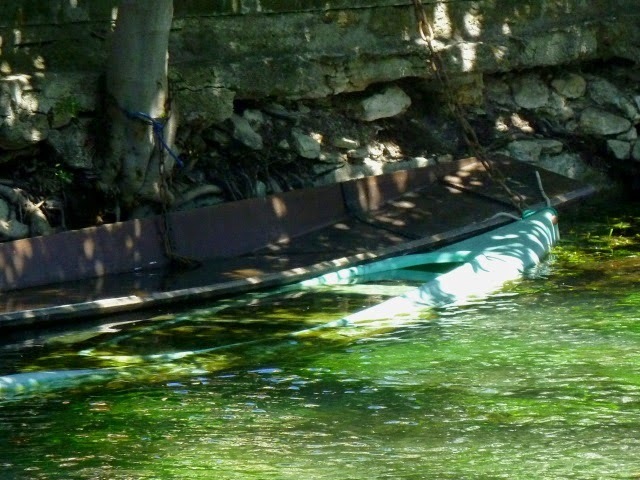 Maybe I should have titled this post "the mysterious sinking punts of Provence," which is where we've been on holiday. 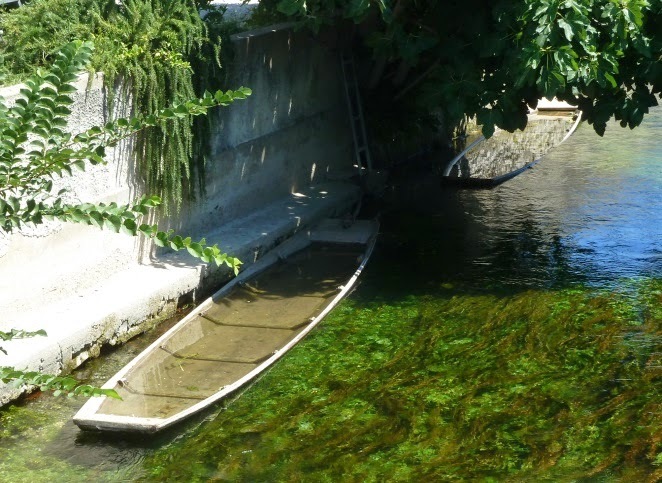 In the delightful town of L'ille sur la Sorgue the river (the Sorgue) splits into five canals which formerly fed water mills and industry. 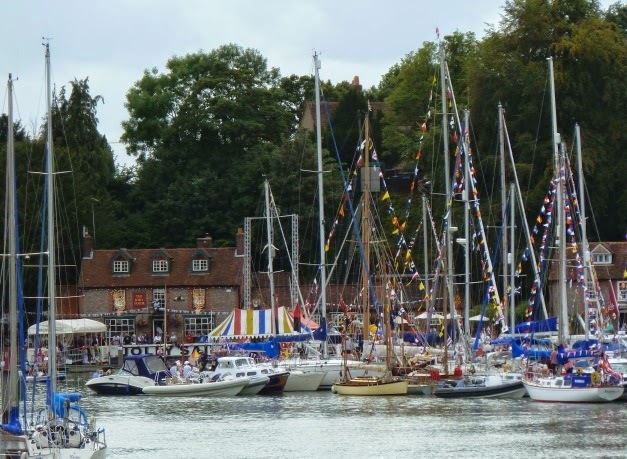 Today the town provides tourists with waterside restaurants, antique shops and a hugely popular market at the weekend. What was strange however was the almost universal practice of sinking punts in the canals, like the two examples above. Those were not in the minority and walking around the town it seemed like every punt we came across was doing a submarine impersonation. 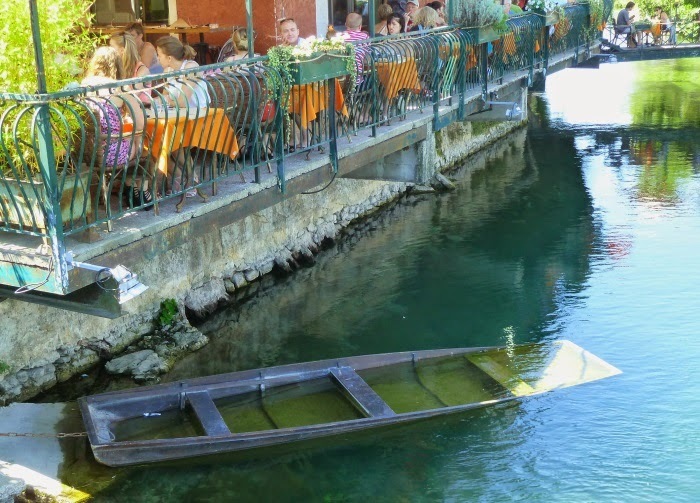 Like this one below, the waterside dinners seemed totally unconcerned that it might slip from view into the depths at any moment. Not only punts, but this canoe was stored in the same way. 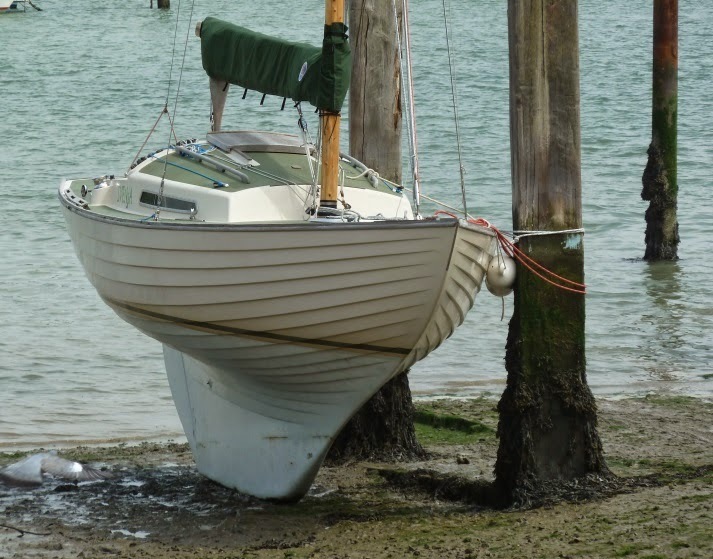 Now I'm aware that old wooden craft need to keep wet in order to keep the seams tight, so maybe with the hot Provencal summer (32 degrees plus most days) keeping the boats submerged is the only way to prevent them drying out? 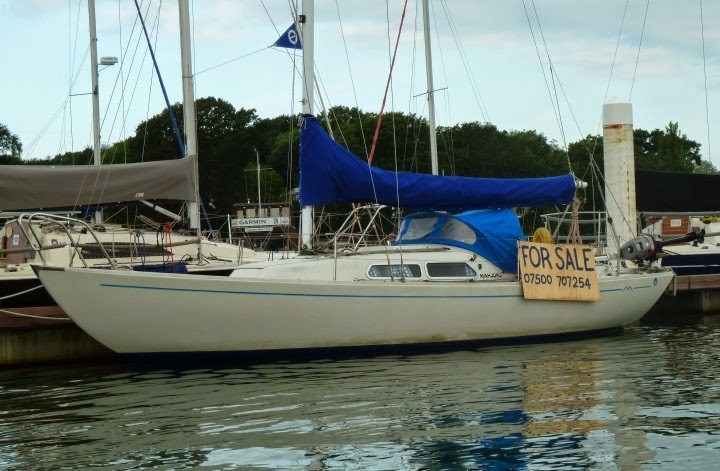 We've put our First 210 Matilda Emilie up for sale so apologies for the blatant commercialisation of the Bursledon Blog which up to now has been free of adverts but as they say there's no such thing as bad publicity. 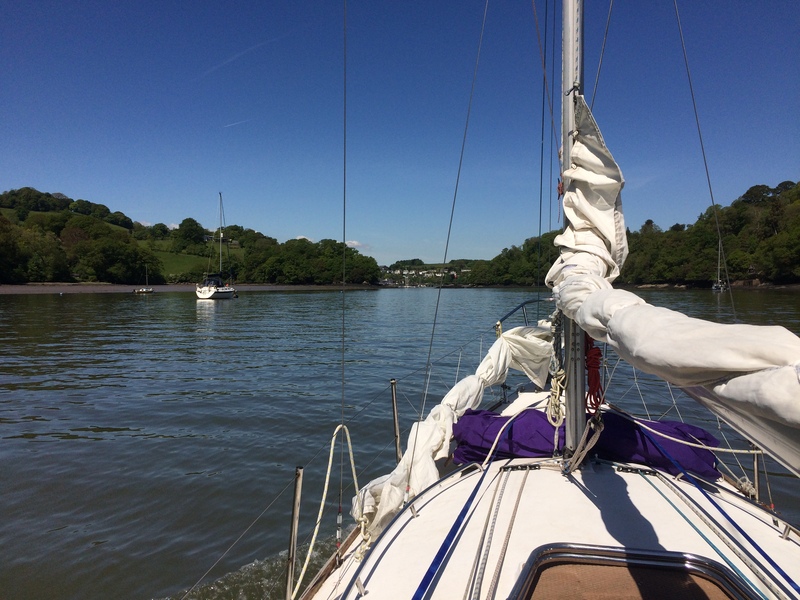 The First 210 is a fast and fun boat, one of the reasons we bought her is so we could go for a few hours sail at short notice, we can be off the mooring and sailing in under 10 minutes. 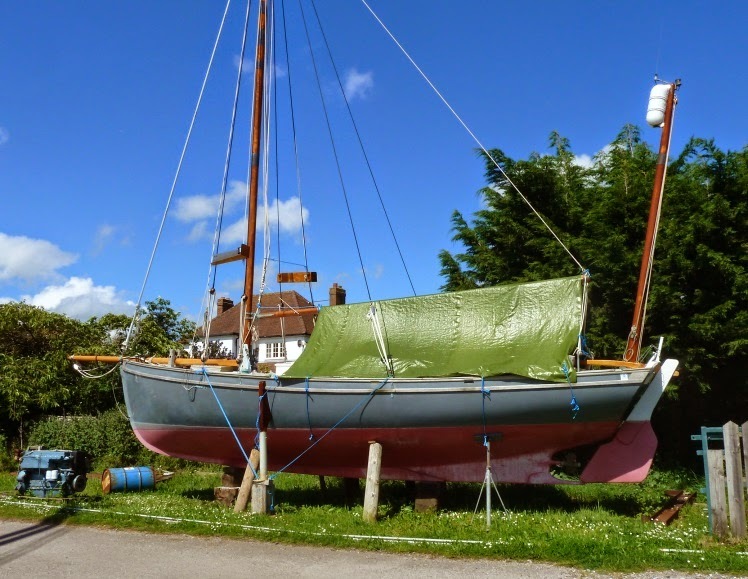 She sails like a big dinghy, but the drop keel and good form stability means she feels safe and stable. 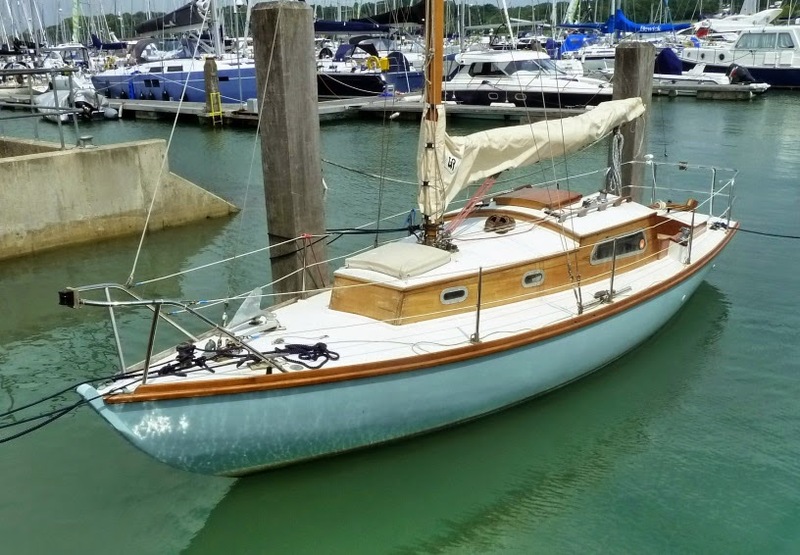 As a fast weekender she is really well suited for our local waters, pointing high allows us to get to places quickly, we can always find a mooring even in the most crowed of Solent hot spots and the accommodation is very comfortable for the three of us. The open plan interior really changed the game for small 21 footers, maximising the space and creating an light airy accommodation which is easy to move around in. With a young child a safe cockpit is essential and the First does it brilliantly, our shortlist when we bought Matilda was the Sun 2000 and First 210/211 with the First winning hands down. 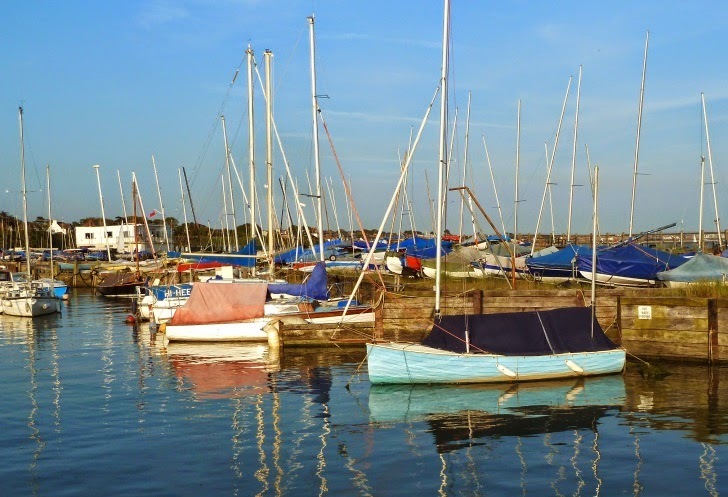 Special discount is available for Bursledon Blog readers. 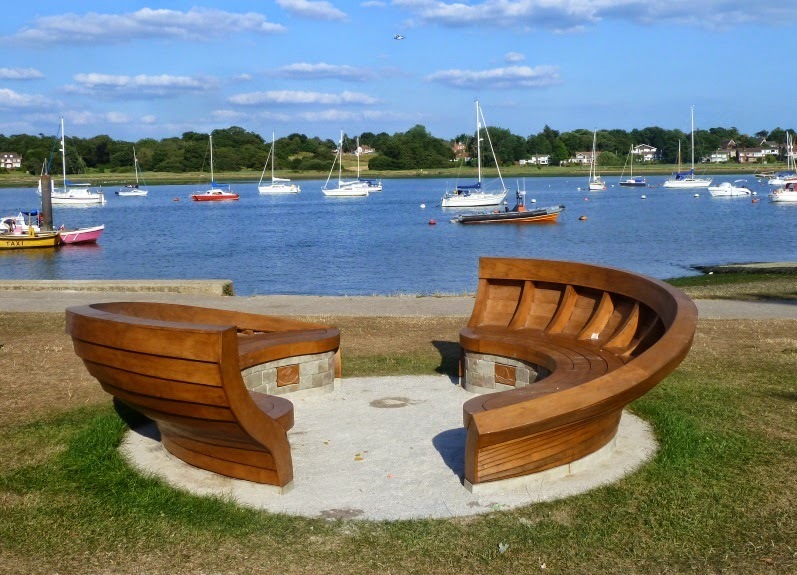 If you're walking by the Hamble fore shore you could do worse than pause and rest a while, take in the view of the boats and admire the new seating which has been installed. 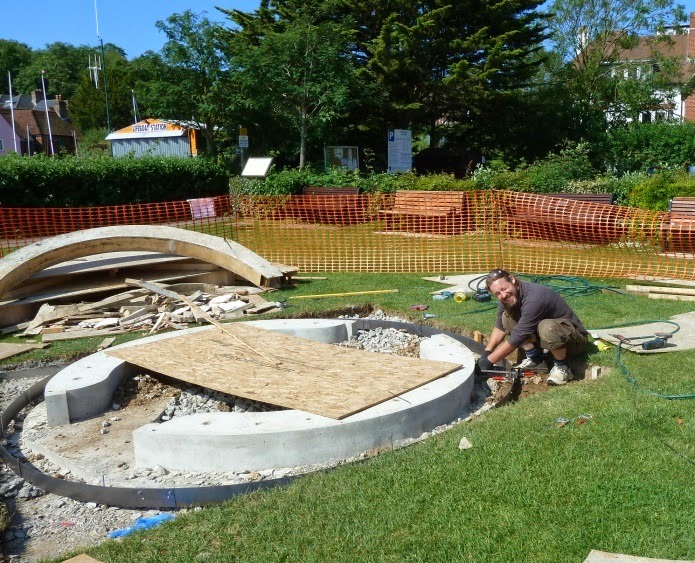 Entitled "Clinker Boat Bench" by artist Tim Norris who specialises in large-scale outdoor Sculptural works, his work draws inspiration from the surrounding landscape and where possible uses indigenous natural materials. 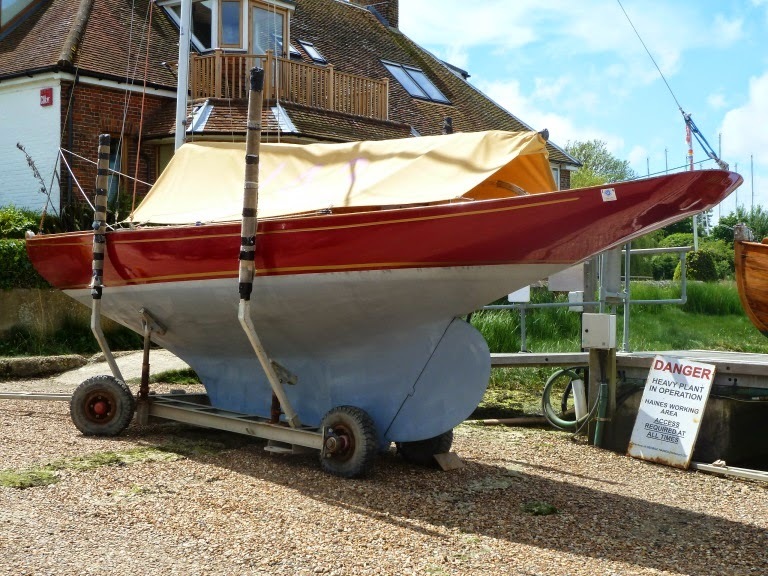 Earlier in the year we were passing while Tim was working and stopped for a brief chat, taking his inspiration from traditional clinker work boats he's produced a terrific and practical piece of art. On the hard for a scrub a local GRP Nordic Folk Boat, looking clean and ready to race. The same day I passed her back on her mooring. In desperation to try and avoid an evening of the same we decided to take tea down to the beach at Hill Head. The sea breeze had set in during the afternoon blowing wet, salty and pollen free air onto the land, what a relief. We sat on the shingle beach eating grilled chicken and rice, apple pies for dessert, washed down with a glass of bubbly. It was one of the best birthday dinners I can remember. Afterwards we walked around the little harbour looking at the boats in the late evening sunshine, doesn't get much better. 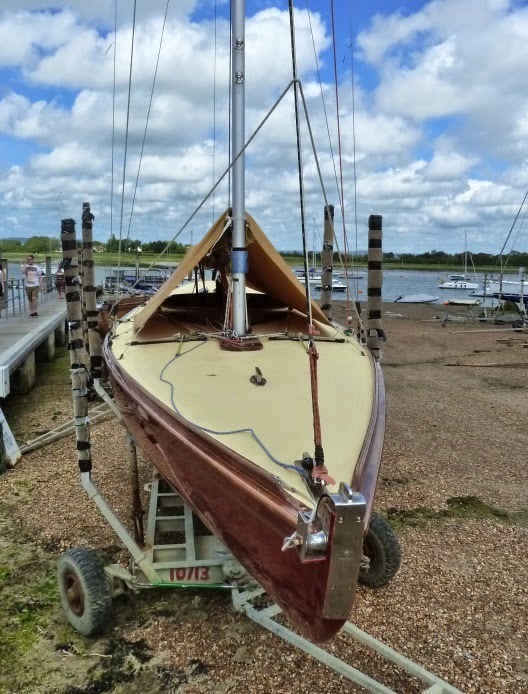 A Solent Sunbeam on the hard at Itchenor, an elegant and really interesting keel boat class. Apparently when Alfred Westmacott designed the boat he had in mind that "that a lady could perform any task on the yacht". It's claimed that this is the reason for the many husband and wife teams in the Solent fleet. The original Sunbeams date from 1923 and are all built of wood using the same materials and traditional methods. 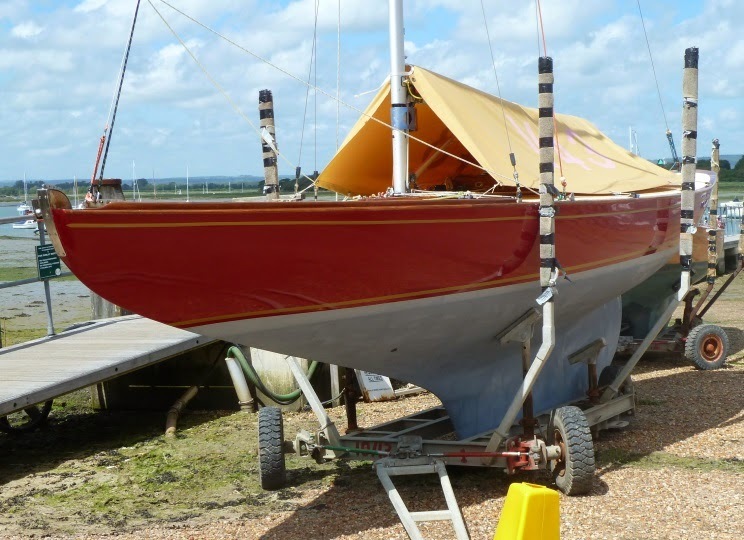 However in 2011 the Solent Sunbeam Class approved GRP as an alternative construction and adopted a new build V61 Betty, after a season of intensive trialling. 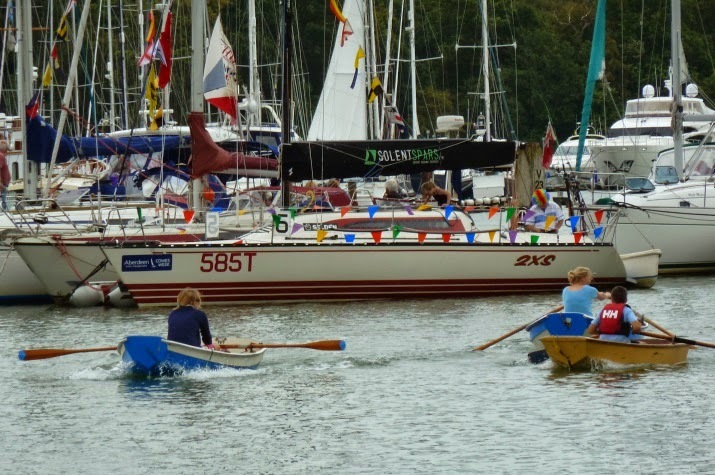 Six further new GRP boats are now complete and all will be racing in 2014. When I was taking the pictures I didn't think to check on the construction, but having looked at the photos those top sides do look remarkably fair and all the deck equipment and fittings look very new so maybe this is one of the new boats. 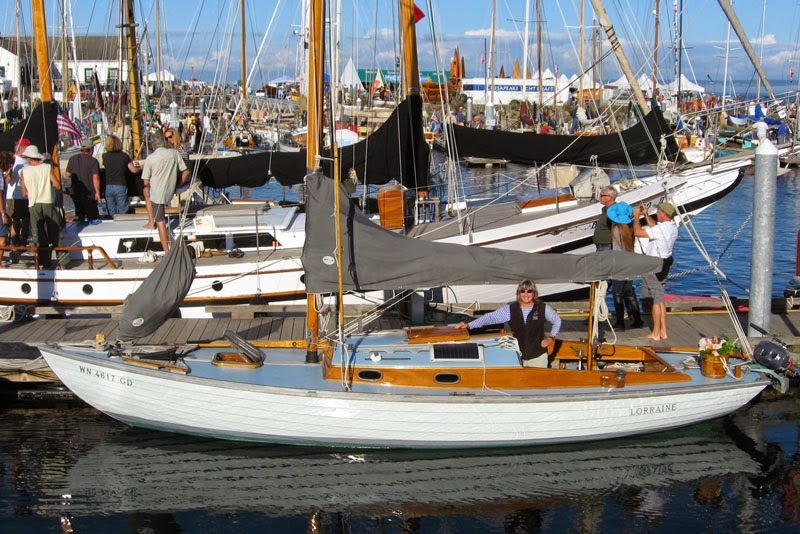 Maybe not exactly a high profile media campaign, but it was definitely on the market and yes it's the same Marieholm which featured in Folk Boat Friday No 3. 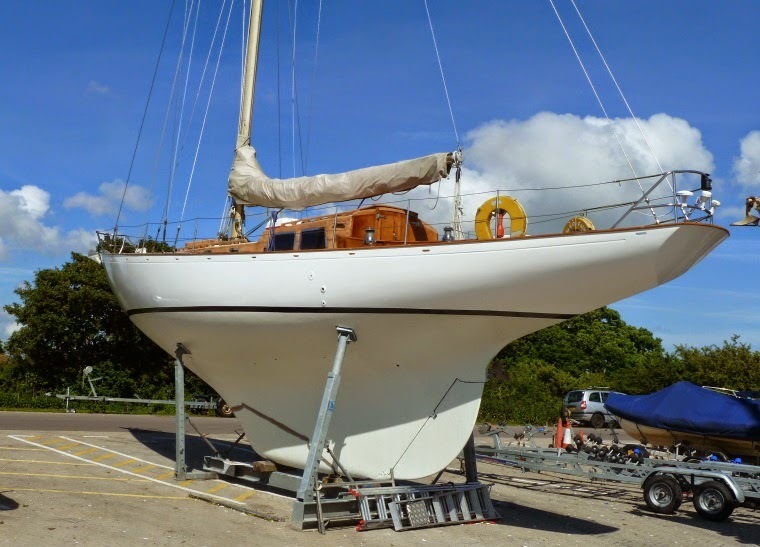 She's just been bought by a friend Steve who I bumped into returning from his first sail on her. Predictably for a boat with low form stability she heels, but then takes off and slices to windward in the frisky Solent chop like a good 'un. Cycling through Chichester Marina I couldn't help notice this stand out boat. With no name visible to help identify it I had assumed it is a Morgan Giles 43, cruiser/racers designed and built by Morgan Giles of Teignmouth at the end of the 1950's for the UK Joint Services. 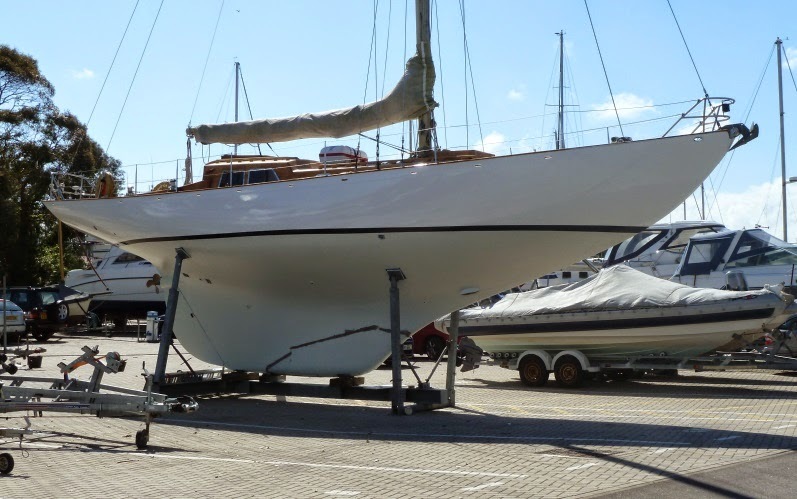 Some research shows that work is under way on not one but three of these yachts Gryphis, Leopard and Petrel all of which have been bought by a single owner with the intention of forming a charter company. Which would explain why there was another identical yacht standing immediately behind although at an earlier stage of work. Leopard was based in the Hamble a few years ago, as a charter boat as I recall, and Petrel was often seen cruising the solent. 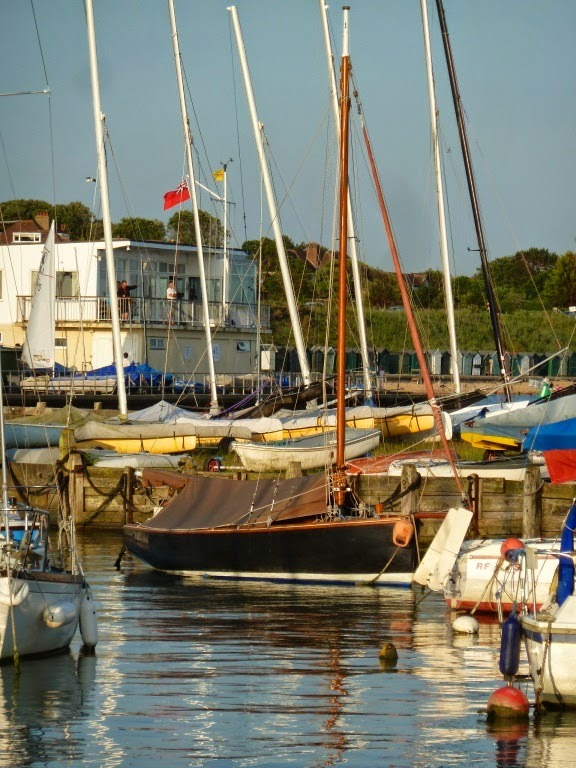 She lay along side us at Yarmouth a few years ago and I chatted to the owner while he pumped the bilges for quite a time, it was a breezy day force 5 and 6 and apparently the seams would open if pressed hard in such conditions. I also went aboard another one, Galahad in Cascais nr Lisbon years ago when we were cruising Blue Clipper. 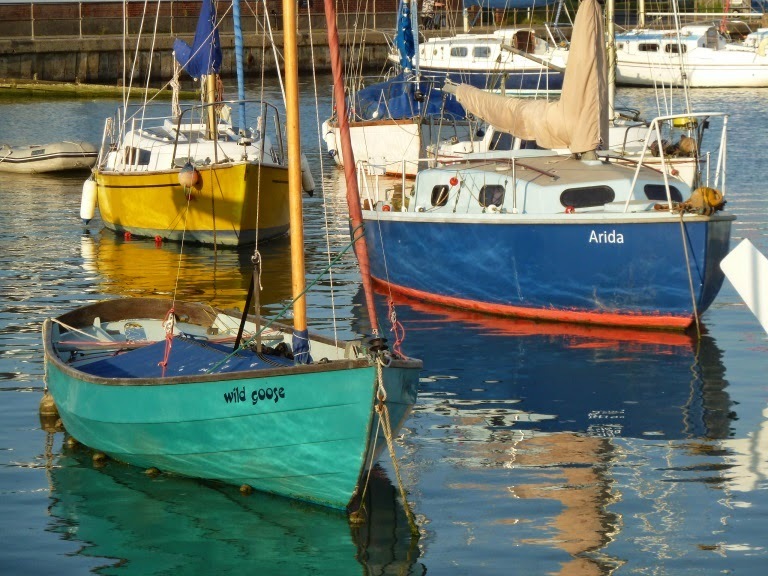 It will be great to see these lovely boats out and about again. 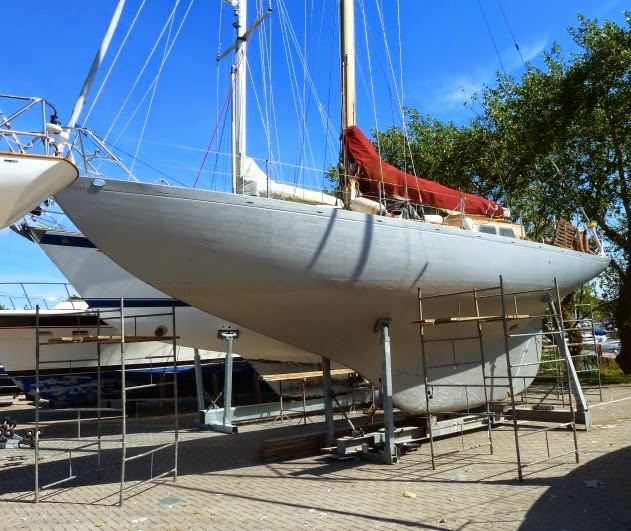 Grey Merlin was apparently named after the paint in which she is finished, but that could just be local legend. 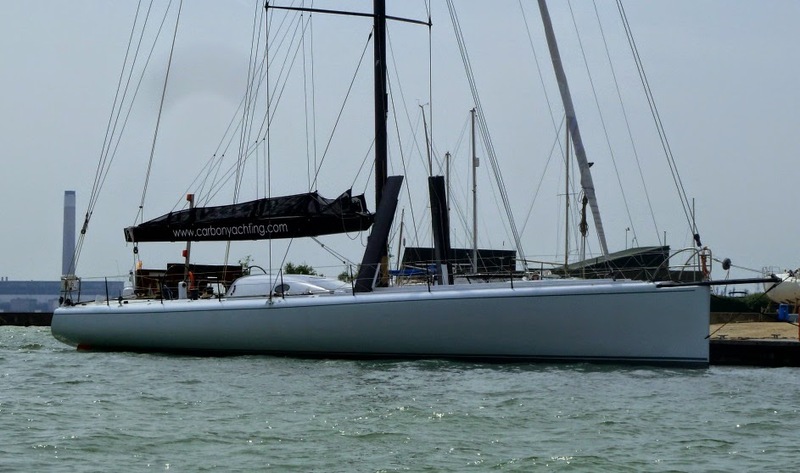 What is fact is that she's a high performance gaffer built on Nigel Iren's Roxanne hull with a gaff yawl rig instead of the cutting edge lugsail for which the Roxanne and smaller Romilly designs are known. I've seen her many times over the years and she always looks so right, at first glance she could be a traditional work boat but it's only on closer inspection that her heritage become apparent. It was really hard getting a picture of this lovely wooden folk boat, first time I saw her I couldn't get the camera out in time, the second time she appeared I was shooting into the sun. Just as we were having a beer at the club I saw her making through the moorings and managed to snap this.